The Legal and Social Issues Committee has presented its final report on the Government’s departmental restructure following the 2014 November state election. The Committee has made five recommendations to improve the monitoring and reporting of such Machinery of Government changes. “A key recommendation is for a clear framework to be established for monitoring and recording expenditure and outcomes from such changes,” Committee Chair Edward O’Donohue said. Mr O’Donohue said the Committee discovered there is very little guidance for departments in Victoria in relation to tracking of Machinery of Government costs. “This has resulted in inconsistent and incomplete reporting of associated expenditure and outcomes,” he said. 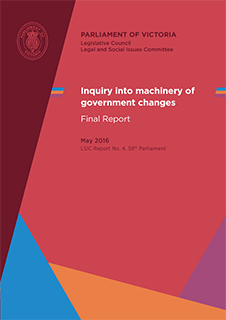 Machinery of Government changes can be expensive, the Committee noted in its report. “By the end of January 2016, the direct Machinery of Government costs following the 2014 election had already exceeded $5 million,” Mr O’Donohue said.